Symbol of battle | Where Did You Find God Today? My son, James, and I belong to Toastmasters. Each meeting offers a chance to think on our feet as one member asks impromptu questions and calls on others to answer. We call it Table Topics. Last night, he told us flags are battle signs. They mark where the soldiers are and designate the battle line, i.e. the land they have conquered up to that point. That is why there is so much emotional response to a flag, even during times of peace. He asked what symbol would we be willing to die for. I believe the United States is in a dark time. So are other countries in the world. Battle lines have been drawn, and we are at war…with those who would desire to take away our freedom to worship and with those who call us, the ones who pray to a redemptive God of forgiveness and love, hypocritical haters because we will not bend to the winds of current social trends. Over two millenia ago, Paul encouraged us to put on the full armor of God. We need to dress appropriately before we can fight against the principalities which threaten to undo our faith. The cross goes before us. It symbolizes one who was willing to die in order to save us. Will you pray to Him and ask Him to save your country before it dies? Then, pray for those who are being persecuted, and even executed just like the Savior, for their steadfast faith as they battle prejudice and evil in this earthly life. Because there but for the grace of God go you and I. Today, God is asking each of us an impromptu question. What will be your answer? 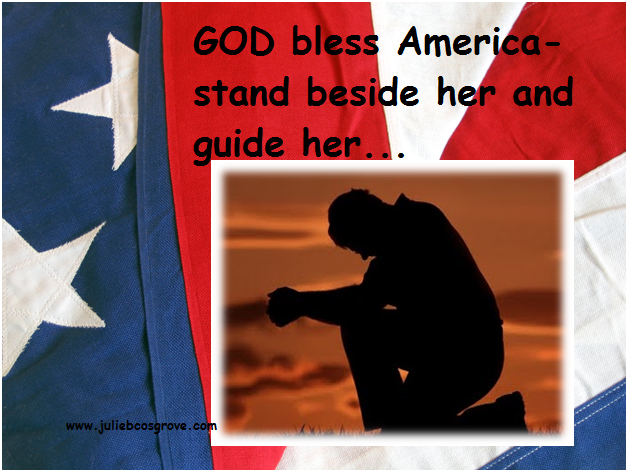 And Julie, how long has it been since you’ve heard that song, “Onward Christian Soldiers” sung in church? I can’t remember when. I’m concerned that most of Christ’s army is fighting in their undershorts…no armor…little spiritual muscle…little will to win. It’s time to muster the troops to their knees. That’s where the battle is won…in our hearts and minds. Actually we sing it about twice a year. Its in our hymnals. But you are right. Too many people see a love fest, not a battle. But Christ is the Victory already won.